Only the finest raw materials are used in the construction of our range of tables. Suitable for all commercial locations and the Yucon range is available in a variety themes. Please call us now for our best price on this excellent table. When ordering you will be asked for a 275.00€ deposit and the balance payable as Cash On Delivery (applicable to Costa del Sol and Costa Blanca. Other areas please enquire). Delivery and installation to Costa Blanca included. To other areas please enquire. 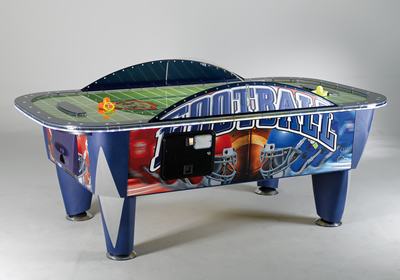 If you are considering a pool table, or Air Hockey table why not take a look at our accessories page for complimentary items such as lighting, covers, rests etc. 100% WATERPROOF! Very heavy duty tarpaulin covers, uniquely made for us with integral elasticated hems. Keep your table in perfect condition whatever the weather. 235€ . See our complete range of accessories. Pete has asked me to email you to thank you very much for the pool table you delivered to our villa in Quesada yesterday he is delighted with it and said it is great quality and workmanship I am sure we will have many years of pleasure from it. What a lovely quality table supplied and fitted on time with the minimum of fuss. Tables may differ from web site photographs through finished material variations and as design modifications are made.